I rotovated the rye cover crop last week. The rye was about twelve inches tall and growing fast. I used a Howard rotovator I borrowed from my partner. Its a fifty- inch wide model. I rotovated to a depth of about five inches. 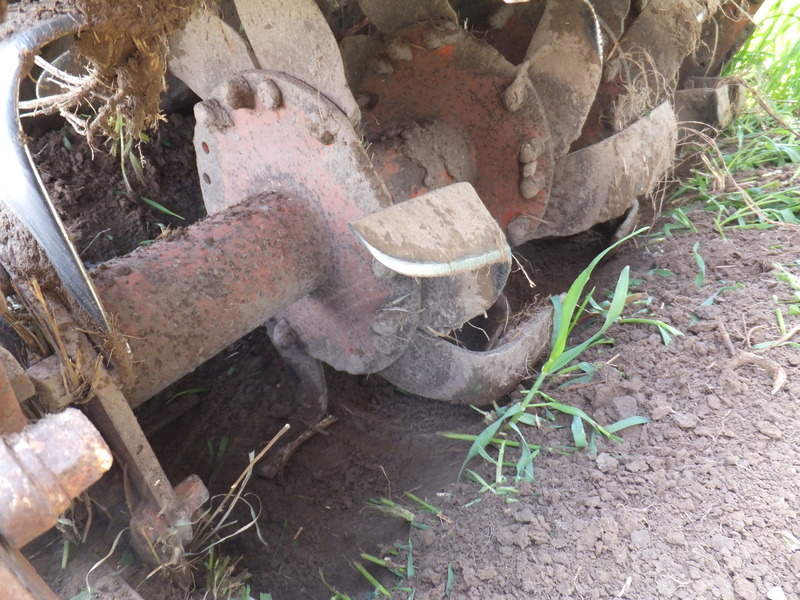 The rotovator has blades which travel downward, pictured below, cutting through the plant and soil, mixing and tossing it backwards. The gate at the back of the rotovator can be raised or lowered with a chain, which will leave the field very rough or fairly smooth. I thought I may plant after this, so I tried to keep it smooth. I wasn’t sure if I should plant sweet corn right away, so I did a google search. When Curiousfarmer came up on the first page, I realized that unless I’m suffering from dementia, I’m unlikely to learn anything from myself. So I called my old organic farmer friend and he told me to wait a week, then rotovate it again, then plant immediately. He thought I could kill any weeds which may have germinated, and hurt the rye again. A week later and I’m glad I’ve waited because although I don’t see any weeds, owing to the alleopathic nature of rye, I do see some of the rye greening up. The rye is very tough. Any larger root-clumps of rye look like they will recover and grow and compete with the sweet corn. I have mixed feelings about tillage. When I garden, I like to keep the soil mulched. But in a larger planting, mulching is impractical, and tillage seems to be the best way to make a good seedbed and set the weeds back. I’m not an expert, but the way I understand it is that one drawback of tillage is that it burns up some of the organic matter in the soil. 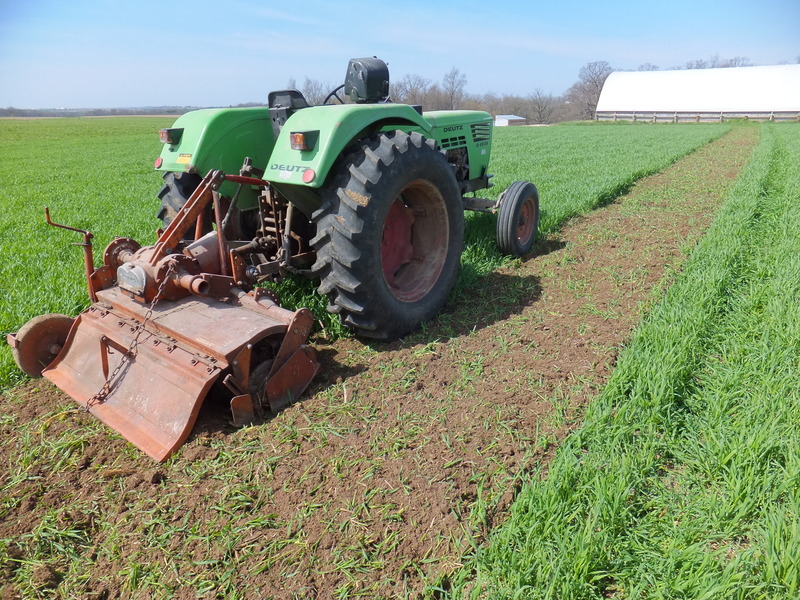 Another thing I don’t like is the potential for compaction, which can happen anytime you drive on a field, but especially in the spring when the soil is moist. When the rotovator cuts through the soil, it ends up smearing the soil and creating a compacted layer at its bottom depth. It leaves the soil above this very fluffy, but I wonder if the corn will have trouble growing its roots though this compacted layer. Remind me to dig this summer and see what is happening with the roots. Rotovators are very popular with the organic and sustainable crowd, so I am glad to be able to borrow this one from my partner. I also don’t think I would try to kill the rye without herbicide with any less aggressive tillage. So all in all I’m happy with the way this experiment is going, but I am still working well outside of my comfort zone. Stay tuned. This entry was posted on Tuesday, May 13th, 2014 at 1:00 am and is filed under Curious crops. You can follow any responses to this entry through the RSS 2.0 feed. You can leave a response, or trackback from your own site. looks like a roto-tiller on steroids!